A work of art that evokes a sense of place can be a powerful thing. It brings up all kinds of memories and yearnings. Dickens was good at it and JMW Turner, but its' not an easy goal to achieve. One of the biggest pitfalls facing The Cutting Ball Theater Company with its world premiere production of Tenderloin, a play about the neighborhood that surrounds the company's theatre on Taylor Street in downtown San Francisco, is creating a lasting impression of The Tenderloin without falling into cliche. The first ten minutes of the show, which is full of beautifully detailed performances from the ensemble cast, are worrying in this regard. We see a bunch of bedraggled characters shuffling about in a state of mental or financial depravity or both and then we move to a bar where we're told by various residents about how rich and vibrant the area is and how it doesn't deserve its bad name. For those of you that don't know, The Tenderloin is one of San Francisco most drug-trafficked and destitute inner city areas. The tourist guides tell readers to avoid it. But it's also transforming. There are quite a few small arts companies in the vicinity as well as trendy restaurants, bars and galleries. It's really quite an interesting, architecturally lovely and fairly safe 29 block stretch of the city and most people who attend The Cutting Ball's productions feel positively enough about it to render the non-stop positive messaging in playwright/director Annie Elias' production completely redundant. That being said, the rest of the show, which is the result of many interviews of Tenderloin residents, has seem startling moments. My favorite story was that of a 60-something ex-soldier -- a confirmed bachelor who lives on his own in the neighborhood -- who through a dint of fate, ends up becoming the primary care giver to a newborn baby. (The infant's mother, a friend, asked the man to take care of her child when she was about to go to prison.) Not only is the story utterly compelling, but Michael Uy Kelly's "gentle giant" approach to the character warms the heart. Also compelling are the scenes enacted by the promising young actress Rebecca Frank and Cutting Ball veteran David Sinaiko (pictured.) 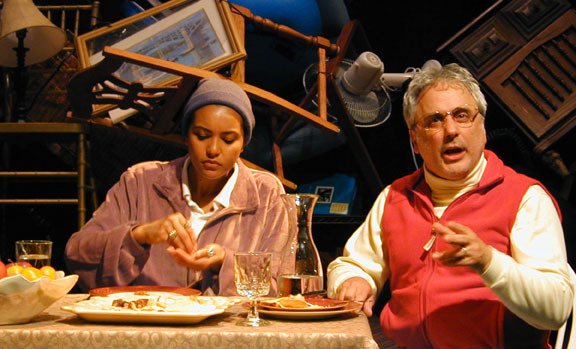 The pair plays an elderly couple who run a hotel in The Tenderloin. Frank, who's barely out of her teenage years, plays the old man, while Sinaiko, a greying dude known best for gruffly masculine roles like Hamm in Beckett's Endgame, essays the role of the wife. Both pull the unusual casting off so seamlessly and believably that I stopped thinking I was essentially watching a drag act. On the downside, the play could have been an hour shorter. At two hours, the length of Tenderloin only serves to dilute the strong sense of place that comes across during the first half of the show.